George Van Ness Lothrop (1817-1897) was born in Easton, Fairfield County, Conn., August 8, 1817. Son of Howard Lothrop and Sally (Williams) Lothrop. He graduated from Brown University in 1838, and subsequently attended Harvard Law school. He was a member of Alpha Delta Phi and Phi Beta Kappa. In 1839, he came west to recuperate his health and for a time, assisted his brother, Edwin H. Lothrop, in the management of his extensive farm in Kalamazoo County. In 1843, he resumed the study of law in the offices of James F. Joy and in 1844, he began practice in partnership with D. Bethune Duffield. He served as the seventh Michigan Attorney General from 1848 until 1851. Lothrop died in 1897 and is interred Elmwood Cemetery in Detroit, Michigan. Lothrup's brother, Edwin H. Lothrop, was Speaker of the Michigan State House of Representatives in 1844. Lothrop's daughter, Emily Anne "Nan" Lothrop (1860-1927), married Baron Barthold Theodorevitch von Hoyningen-Huene (1859-1942), a Baltic nobleman and military officer, and their son was the noted fashion photographer George Hoyningen-Huenemarried 1847 to Almira Strong. Democrat. Lawyer; Michigan state attorney general, 1848-51; candidate for U.S. Representative from Michigan 1st District, 1856, 1860; delegate to Democratic National Convention from Michigan, 1860; delegate to Michigan state constitutional convention, 1867; U.S. Minister to Russia, 1885-88.During his service as Minister, the first extradition treaty was signed between Russia and the United States. English ancestry. Member, Alpha Delta Phi; Phi Beta Kappa. He married Almira Strong, the daughter of Oliver Strong. Their son, Charles Bradley married Isabella Graham Bethune Stewart, the daughter of Dr. Morse Stewart, and they had a son named, G.V.N. Lothrop and a daughter Isabelle Graham Duffield Lothrop who married H. Munroe Campbell Jr.; Isabelle was born in Oct 1890. Lothrop's second son, George Howard married Frances Owen, daughter of John Owen; they had a daughter named, Margaret. 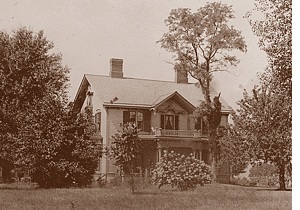 The other children of Lothrop and Almira were Henry B., Annie S., Cyrus E., and Helen Ames.He purchased 130 acres in Grosse Pointe in 1850 and constructed a residence called "Summerside." He and his family spent every summer here, until about 1883, when he made permanent residence "on the banks of the Nova."